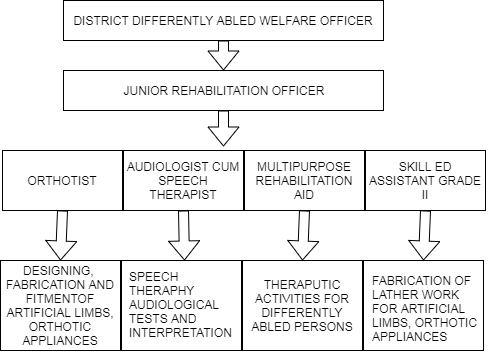 District differently abled welfare office is running orthotic prosthetic unit, Early Diagnostic centre for Hearing Impaired, Physio Therapy Unit. Here we are supporting various schemes for Differently Abled Persons. Financial assistance, Free supply of Aids and appliances, Special Education, Assistance to home for the Mentally Retarded, Mentally Ill. Early Intervention Centres for MR and HI, Government Visually impairment middle school with hostel, Government Hearing Impairment High school with hostel.